← I Can’t Believe It – Thanks To You, I Came in First for Mayor! Let’s Use Our Powers For Good- Support The Inner Sunset Parklet! Earlier this week Loyal Readers and Twitterfriends were kind enough to elevate me in the online “interim mayor” poll to first place. Woo hoo! Today, however, I am asking for Loyal Readers and Inner Sunset residents to come out in support of a project that actually has some impact on our daily lives – support for a parklet on 9th Avenue in front of Arizmendi Bakery. The always-active Adam Greenfield, who’s always out there promoting community building events for the neighborhood, has been working with a dedicated group of folks to bring a “parklet” to 9th Avenue. Many such parklets have been established around town already, and if you’ve ever seen a Park(ing) Day temporary parklet, you get the idea. The artist’s rendition of the propsed parklet for 9th Avenue looks great. However, it needs your vocal support so that the folks in City Hall realize this is something people will value. There will be a hearing (date TBD) but for now it’s important you write to Supervisors Elsbernd and Mirkarimi in support, and sign the online petition. We all know how City Hall will, left to its own devices, get in the way or otherwise cause problems, but we also know if enough people speak up, they tend to pay attention. When you consider the many neighborhood improvements residents (not bureaucrats) have established in the Inner Sunset, it makes sense that we should expand public space where people can enjoy their neighborhood, and this proposed parklet would be a great addition to the area. Let’s do something positive for our community! This entry was posted in Museums and Parks, Urban Life and Culture. Bookmark the permalink. 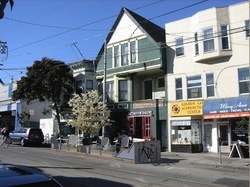 One Response to Let’s Use Our Powers For Good- Support The Inner Sunset Parklet! Thanks Greg! We, the parklet team, is very excited about this and we hope that the rest of the neighborhood will be too. Sign the petition folks. We need your support!